Disclosure Agreement: Review of Crunchmaster was due to compensation from the company’s whose products were reviewed. We Dish Nutrition tested each product thoroughly and gives high marks to only the very best. Opinions expressed at We Dish Nutrition are our own. With several of my colleagues and friends gluten free, over the last couple of years, I’ve adapted how I make meals. I’m proud to say I know more about the selection of gluten free products and ways to eat around gluten due to their dietary restrictions. I don’t envy their daily task of weaving through the aisles looking for things they can eat, however, with the wave of new gluten free products, as you know, the selection of gluten free products has grown multifold. This includes Crunchmaster, with products created in Loves Park, IL. Skeptics of gluten free sanitation and production process can rest assured that the Crunchmaster products are indeed gluten free as the baking facility has been certified by the Gluten Free Certification Organization. 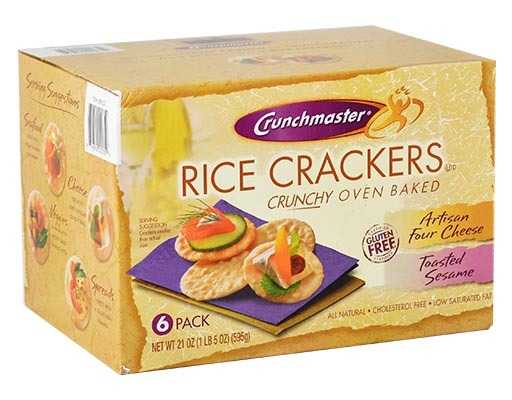 Crunchmaster has perfected the blend of brown rice, sesame, quinoa, flax and amaranth seeds to produce their line of crackers and chips that are 100% whole grain, cholesterol and trans free and low in sodium and saturated fat. While Crunchmaster has a ton of multigrain crackers, I skipped ahead of all those products and went straight for the edamame chips and baked rice crackers. As a health conscious individual, I was eager to try Crunchmaster’s healthier options. After trying the baked rice crackers, I wondered if baked is really better than fried. That’s where detective hat entered the scene. In comparison to fried, baked chips are lower in calories and fat. However, the sodium content of the baked chips tend to be higher than fried and baked chips contain acrylamides, a cancer causing chemical that is produced when high carbohydrate foods, such as potatoes, crackers, cereals are heated to high temperatures. So, while baked chips have some health benefits,eating in moderation is key. Yet, one of my favorite aspects of the Crunchmaster’s website is their superb recipes. I am always intrigued by the thought of “what can I do with this ingredient” or “what kind of blend will be formed if I combine x and y.” Thankfully, Crunchmaster has taken the guesswork out of the equation, providing readers reliable recipes. Some of the recipes I’ve added to my list of recipes to try include Wild Cheddar Stuffed Mushrooms, Sweet Potato Fries and Sweet Cherry Cobb.